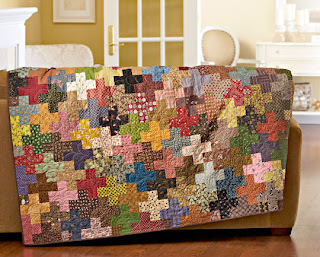 In my latest edition of American Patchwork & Quilting I saw this lovely quilt pattern called Charming Addition by Kathie Holland. I knew immediately that this was a quilt that I needed to do! I loved the plus signs patches and absolutely LOVED the fact that it was a scrapbuster quilt!!! In Kathie's quilt she didn't repeat a single fabric and so I'm challenging myself to do the same! It's also been a good project to straighten up all of those bins that so easily get out of order! I'm excited about this new project and can't wait to see how it turns out!! Don't forget, in honor of Veteran's Day I'm running a special in my Etsy shop from 11/9-11/12. Use code VET5OFF to take 5% off your order!